When my client had her engagement ring and wedding band stolen, she dreamed of a custom designed ring that would capture the essence of both rings into one. 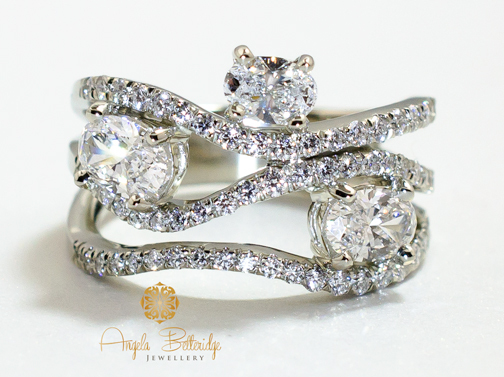 The three diamonds in this 3 stone ring Forever Ring portray the client’s past, present and future. Three meandering bands tell the story of her life’s paths travelled and journeys still to be taken. I will create an exclusive custom design tailored to your desires, then my award-winning network of goldsmiths will custom craft your unique jewellery; whether it’s an engagement ring, a wedding band, a pendant or earrings or even remodelling heirloom jewellery into a piece that you’ll want to wear all the time there’s no limit to what can be done. Angela Betteridge Jewellery has the perfect custom crafted jewellery gift to communicate your sense of love and appreciation that the you and the recipient will treasure for a lifetime. I work closely with my clients to help them realize their perfect personal and corporate jewellery gift ideas. Designs can be produced in Canadian Certified Gold ™, silver or platinum and for a really special gift, consider adding breathtakingly beautiful Certified Canadian Diamonds. Have your own story told in custom jewellery by Angela Betteridge Jewellery. Custom crafted jewellery can be created in many different price points to suit my clients’ budgets, just because it’s custom does not mean a hefty price tag, find out more and contact me for your personal consultation for custom jewellery in Kelowna.